The pharmacy benefit marketplace has been at the center of attention lately due to a combination of factors, including the growing list price of brand medications and the impact their prices have on the participant, particularly those enrolled in high deductible health plans. The outrage over Mylan’s price inflation of its EpiPen® product fostered an array of news articles, television interviews, congressional hearings, campaign promises and finger-pointing among pharmacy supply chain stakeholders. The pharmaceutical supply chain is complex both by necessity and design. Distributing medications, including temperature-controlled biologics, from the manufacturer to the patient necessitates a mechanism that provides adequate patient access and uncompromised quality and safety. Given the unique distribution channel and the imperfect market, stakeholders have also designed a system that maximizes revenues and profit at the expense of patients and plan sponsors. While the stakeholders in the supply chain point fingers, plan sponsors should recognize that nearly all members of the system benefit when prices increase. However, price inflation is nothing new. In a Health Affairs1 article penned by former United States Senator David Pryor from 1990, it was noted that prescription drug prices, as measured by government price index data, soared 88 percent between 1981 and 1988, a rate three times faster than the rate of general inflation. The article also cited a study at the time that price increases explained 97 percent of the increase in overall national prescription drug expenditures from 1980–1987. Since then, prices have continued to rise, fueled by a broad number of factors. The point? The anecdotes provided by most pundits who write or speak on pharmacy benefits and the pharmacy marketplace may be contributors to the problem, but no single action by any single player can be characterized as the overall cause. The system we have today is the result of decades of action and inaction, and everyone shares some of the blame. What’s the fix? There clearly isn’t a simple fix, but employers and other plan sponsors can start by identifying and acting on those things that they can control. For example, plan sponsors can’t control what list price a pharmaceutical manufacturer assigns a product. It can control, however, how it contracts for those products, including the negotiated discount off list price and manufacturer rebates. Plan sponsors can also adopt more limited formularies and implement more restrictive clinical criteria for drugs that offer little clinical value at high list prices, even when they come with large rebates. Pharmacy cost trends are a result of changes in both price and utilization, and there are numerous strategies plan sponsors can take that are within their control. The key is to execute on fundamental contracting and plan design strategies before trying to tackle the entire delivery system. Evaluating trend can be tricky business. Like any prudent analysis, an important aspect of evaluating pharmacy trend is to put the data within context. One way to do this is by looking at all data using a common denominator, such as per member per month (PMPM). 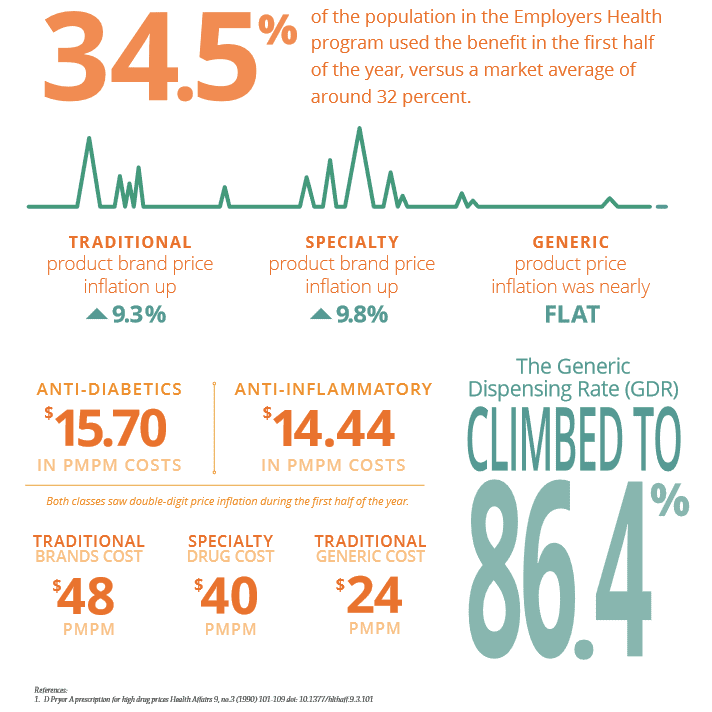 First half gross trend for the Employers Health book of business (BOB), before application of rebates, increased by $1 PMPM, which equates to about 1.2 percent. The gross PMPM for the BOB tends to have a higher PMPM than the general marketplace given the mix of active employees versus retirees within the population, along with a higher incidence of chronic diseases such as diabetes.